Temperature Sensors field includes all the sensors connected to the controller or its accessories (for example, Aquastream pump or Power Adjust 2 modules), as well as three built-in sensors to monitor temperature for Aquaero 5 CPU and power transistors. Sensors name are free to be changed as you like (this is true to all sensors in Senors tab). 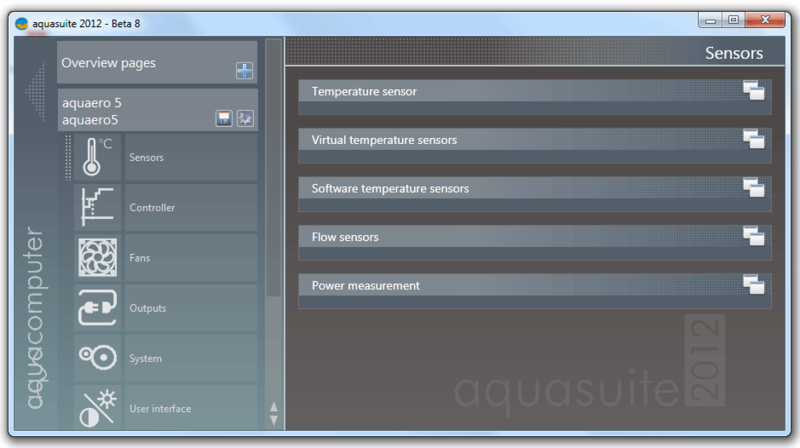 Aquasuite 2012 even allows for sensors to have same names, although this could be Beta software flaw. All the sensors, including built-in ones (and it is odd) are available for calibration, from -6K to +6K with 0.01К step. The screenshot above shows we had six sensors connected to Aquaero 5. First two, Water Out and Water In, are Inline Temperature Sensor For aquaero, aquastream XT that measure temperature of heat carrier on its way in and out of radiator. Last four are the ones that came with Aquaero 5 and are located as follows: three of them: Air In 1, Air In 2 и Air In 3 are located in front of each section of a triple size radiator (one per section), while the fourth is situated 0.5 meter away from bench table to measure the ambient temperature. We should outline that sensors included with Aquaero 5 have quite small dispersion in the readings compared to ones that come with m-cubed T-Balancer, despite the fact that S103LO3/S103СO3 and TFF-103 thermistors share same specification. Next is Virtual temperature senors field. Readings from these sensors is generated by mathematical transformation or selection of data gathered from previously described sensors. For example, you can set the selection of max temperature out of three senor readings, temperature difference or absolute temperature difference, or average of three sensor readings. Simply drag-n-drop sensors from “Data sources” into fields marked as: 1, 2 and 3. Moreover, you can use readings generated from one virtual sensor as data source for another one (requires software restart). So we used three virtual sensors in our review. First one, Water Avg., calculates the average from two in-line sensors, the second one — the average from air in sensors, while the third one, Delta shows the absolute difference between first two. Next field is for Software temperature sensors. 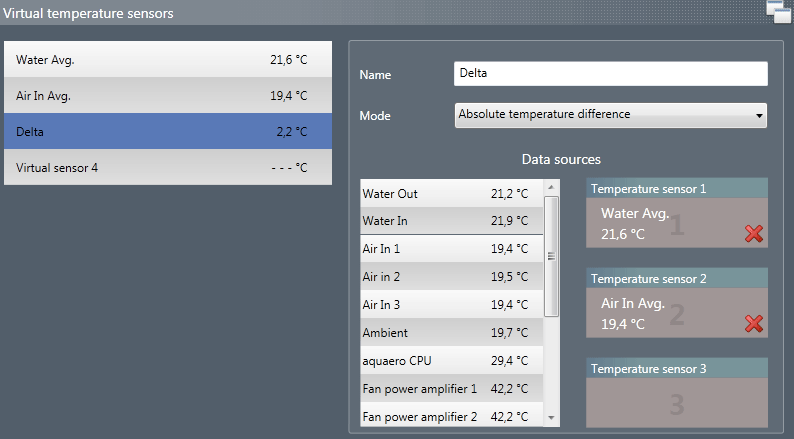 This means that Aquasuite 2012 can have control modes configured depending on sensors built-in your CPU, GPU, HDD etc. At the moment software sensor integration is supported through Open Hardware Monitor (freeware) tool only. 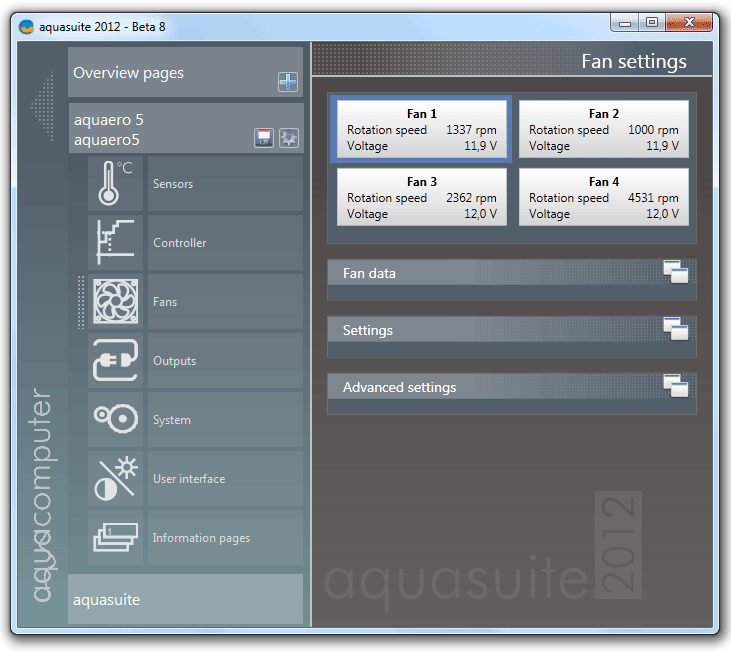 Although software sensors are already presented in Aquasuite 2012, this feature is still not functioning right. So we put software sensor settings on ice for a while. Sensors tab also includes field for flow meter configuration — Flow Sensors. You can connect two flow meters directly to Aquaero 5: one to “Flow” connector and second on to the 1st fan control channel (details here). Using available peripheral device for Aquaero 5 you can connect six more flow meters which is, practically speaking, needless for a regular LC user unless you are flow-sensor tester. As usual flow meter settings feature entering exact Calibration value for particular model in order to convert impulse/hour in to more understandable liter/hour. For this review we used Digmesa FHKUC 70 flow sensor that has Calibration value of 165 impulses/liter. Other than that, you can also set the limit value (max flow rate, min flow rate)so later on to use them as parameters for alarm/warning actions in case something goes wrong. And finally, Power management that was successfully moved from Aquaero 4.0 software. Power management allows users to roughly estimate the amount of heat carried between two points in LC loop. Same as before you will need two temp sensors and a flow meter data for calculations. Since there is no detailed manual for Aquasuite 2012 yet, we are not aware of a formula behind calculations, therefore it is hard for us to comment on the numbers we got. Next we move to Fans tab. There are four main fan control channels by default, however, the number can be increased to 10 by connecting six Power Adjust 2 modules. In that case all of will be visible in Fans tab. The tab contains different fields with information on fan or LC component, connected to four main control channels, current operation status. In addition, settings in the tab allows user to limit fan/pump speed to desired level. Fan data field contains information on current fan status: speed in RPM and percents, power voltage and amperage, as well as temperature of a power transistor responsible for that particular control channel the fan is connected to. Besides, it features fan powering graph during the last 60 min. The graph is not scalable. Next is Settings field that offers user to set the name of control channel and limit fan RPM. “Hold Minimal Power” sets the minimal speed at which fans continues to spin regardless of control mode settings. Advanced settings provide a more comprehensive control over fan speed. “Power controlled” — fan speed controlled by changing power voltage which makes the fan to react immediately to changes in temperature from a sensor. This mode can provide control over 2-pin and 3-pin fans. “RPM controlled” — this mode is dedicated for 3-pin fans only since its speed is control depending on data from a third (tacho) wire. i.e. on fan RPM. Therefore, fan power voltage alters smother and as a result, its speed change not as quick as in “Power controlled” mode when temperature drop/rises. “Calibration” — used in “RPM controlled” and “PWM controlled” modes to calibrate fan tachogenerator data. The default value is 2 impulses per rotation which is typical for majority of fans/pumps. “Current limiting” — used in order to limit current consumption of power hungry fan/pump or several fans connected in parallel. The value is sent with 0.01A step. “Use startboost” — functions that powers the fan at a level required for a spin-up for a short period of time. “Duration” — duration of a “Use startboost” function. “Power” — the level of spin-up power voltage for “Use startboost”. Set in percents or volts. “Minimum rpm” — limits fan speed by set minimum RPM value. Works only for “RPM controlled” mode. “Maximum rpm” — limits fan speed by set maximum RPM value. Works only for “RPM controlled” mode. We all know that some fans have high start-up voltage. But when undervolting, these fans can operate well even below that value. A good example of such fan is Phobya Nano-G 14 we had in our lab. With starting voltage as high as 6.45V the fan can run at twice as lower voltage with no problems. This way, when system starts Aquaero 5 will power the fan with 7V for a 2 second period, afterwards power voltage will drop to required 5V.